Ensuring the lamp efficiently converts electricity into light (lm/W). Controlling the electricity supply to the lamp (Energy Efficiency Index). Controlling light emission using optics which bend and shape the light to the correct location. Combining optical and thermal control within the luminaire (luminaire lm/W). Presence: Lights automatically turn on/off with movement. Absence: Lights automatically turn off and must be manually switched on. Artificial lighting which responds to the natural light conditions. A function designed to produce correct light levels for the duration of the maintenance period. Allowing the user to set scenes and adapt the lighting to different tasks. Automatic cut-off can be installed to turn all lights off during unoccupied hours. Lighting task areas with the correct amount of light. Lighting is zoned according to area use. Maintenance must be performed in response to product age, performance and environment. Eliminating waste light which does not hit the intended target. Taking advantage of light which is reflected from the surface within the space. Results of actions can be quickly seen as increased or decreased energy use to encourage responsible energy consumption. 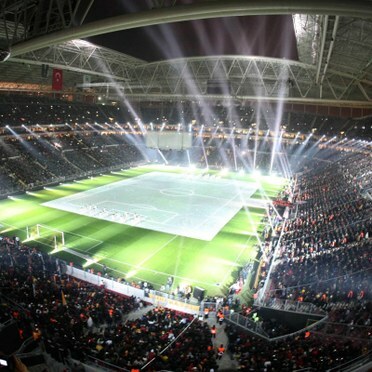 Seating 52,650 people, the Türk Telekom Arena in Istanbul is one of the finest multi-purpose stadiums in Turkey. It is the new home ground for soccer club Galatasaray S.K., replacing the old Ali Sami Yen Stadium. The games, which cover a range of competition levels, are televised in HD and also need to fully satisfy UEFA criteria for hosting the European Football Championship in 2016. The solution lay therefore in providing high quality white light as well as achieving strict lighting control. The choice fell on the Mundial R floodlight with 2kW metal halide lamp. Nearly 350 projectors provide ideal colour TV coverage (1400 lux for the camera at pitch level); they also provide excellent spectator – and player viewing. Four switching levels operate: international (100%), national (50%), training (25%) and maintenance via 12 separate Mundial C units. Main contractor for the scheme was VARYAP, with local partner Kitoko Aydinlatma & Muhendislik representing Thorn. The project took 18 months to complete with the opening, on 15th January 2011, marked by a friendly match against Dutch club Ajax Amsterdam. The new installation at VfB Stuttgart provides outstanding light quality meeting the requirements of DIN 12193.